Features manuscript annotation referring to the 1887 America's Cup Yacht Race. Coast Chart No. 120 New York Bay and Harbor New York. 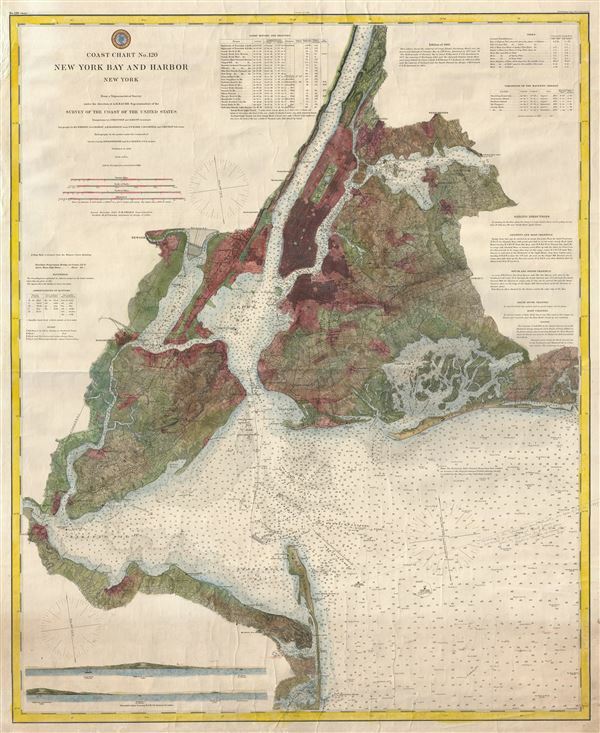 This is a rare U.S. Coast Survey nautical chart or maritime map of New York City, its harbor, and environs. First appearing in its completed form in 1866, this is among the first 19th century charts to depict New York City as we know it today, including Manhattan, Queens, Brooklyn, the Bronx and Staten Island. Adjacent Jersey City, Newark and Hoboken are also included. It offers comprehensive inland detail throughout noting street grids, parks, towns and communities. In addition to inland details, this chart contains a wealth of practical information for the mariner from oceanic depths to harbors and navigation tips on important channels. It also includes tables of light houses and beacons, tides and magnetic declination as well as detailed sailing instructions. This particular example features interesting pencil annotation in the lower right quadrant illustrating the course of the 1887 America's Cup race between the New York Yacht Club's cutter Volunteer and the Scottish Royal Clyde Yacht Club challenger Thistle. Both ships had been recently redesigned for the race by the top shipbuilders of their era, Edward Burgess (Volunteer) and George Watson (Thistle. ). The Volunteer ultimately proved victorious, defending its title and keeping the America's Cup in the Americas. The triangulation for this chart was prepared by J. Ferguson and E. Blunt. The topography by H. L. Whiting, S. A. Gilbert, A. M Harrison, F. W. Door, C. Rockwell and J. M E. Chan. The hydrography was accomplished by R. Wainwright and T. A. Craven. The whole was originally published in 1866 under the supervision of A. D. Bache, Superintendent of the Survey of the Coast of the United States and one of the most influential American cartographers of the 19th century. It has been updated to 1885 under the supervision of F. M. Thorn. It is noteworthy that this present example is on thick stock and backed with linen and is not, therefore, the more common Coast Survey annual report issue, but rather an independent production intended for working mariners. Very good. Independently issued edition backed with old linen. Some minor damage and repair along left margin, not extending onto printed area. Working sea chart with some navigational notes in pencil, could be erased at buyer's discretion. Rumsey 5328.000 (1866 edition), 1234.115 (1877 edition). Phillips, 2141. LeGear, Atlases of the United States, L2307. Phillips (America), p. 492.